For your benefit we function as an extension of the management teams of these manufacturers with full access to their services and support. With over 60 years of Medical Imaging experience, our in house team can skillfully address your questions and planning needs. With the addition of our manufacturer, partners it sums to well over a few hundreds years. We take pride in being a knowledgeable resource to the imaging industry. Our resources are available by phone or through the Internet. Shipping is immediate on most products. An advantage of shopping online is immediate access and shipment. If your order is placed and entered by 3pm EST M-F for a stock item it will typically ship that day. This is a highly competitive business. If you should happen to find the item you're searching for elsewhere for less please let us know. We'll do our best to offer a better price of at all possible. Check out our Price Match Policy for all the details. Medical Displays for Less (DBA; the online site of Monitors, Inc.) is committed to providing the highest quality of goods and services at the best value. We practice a consultative approach to equipment selection, purchase and support through the useful life of the items you receive us. The founders of Medical Displays for Less have extensive medical imaging, science and healthcare administration backgrounds and endorse a corporate culture that serves the field from which they have been contributors to for several decades. Medical Imaging is our only business. We are experts and dedicated to this field. The Medical Displays for Less technical support, and customer service team come directly from the medical imaging field with experience in hospitals, clinics, outpatient and outpatient services, tele radiology and remote reading practices. They are part of the emergent EHR evolution. We do more than sell displays. Our technical support group can assist you with the selection process, technical planning and deployment decisions to assure acquisition of the appropriate equipment for your application at the proper investment level. The quickly evolving field of teleradiology, remote reading and PACS requires unique and current skills, knowledge in the application of the technologies, equipment and networking. With resident experts in all these areas we are available to compliment you and expand your thinking as you address these challenges. The Company has significant talents in addressing asset management in the changing reimbursement and capital equipment depreciation environment. In short, we can be the perfect asset to your management team. Our business is dedicated to helping you select, purchase and confidently use the products you receive from us to support the success of your business and who you serve. Through the life of your relationship with us we remain ready to assist you with the decisions that facilitate your satisfaction with the products and services we offer. We look forward to hearing from you. 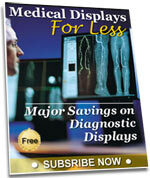 Please contact us at: info@medicaldisplaysforless.com or 866-369-1902.